Gokarna, located in the Uttara Kannada district of Karnataka, is a pilgrimage center and also an important tourist spot because of its beautiful beaches. It is located at the confluence of two rivers Aganashini and Gangavali, and the place where the rivers converge forms a shape that's similar to the ear of a cow, hence the name, Gokarna. The Mahabaleshwara Shiva Temple in Gokarna makes this place a holy center for Hindus especially Shaivites from all over the country. Rumours have it the Shiva Linga here is considered to have been brought by Ravana. Gokarna is fast becoming a favored tourist destination and it has several wonderful beaches that could easily rival the beaches of Goa. The Kudle Beach, Gokarna Beach, Half Moon Beach, Paradise Beach and Om Beach are the five top seaside attractions here. It is a perfect getaway spot for the weekend as you can either head to the sun-kissed beaches and relax or go exploring the rich heritage that the town has to offer. Here is a guide to the beach town of Gokarna. Click Here for the Best Hotel Deals in Gokarna. 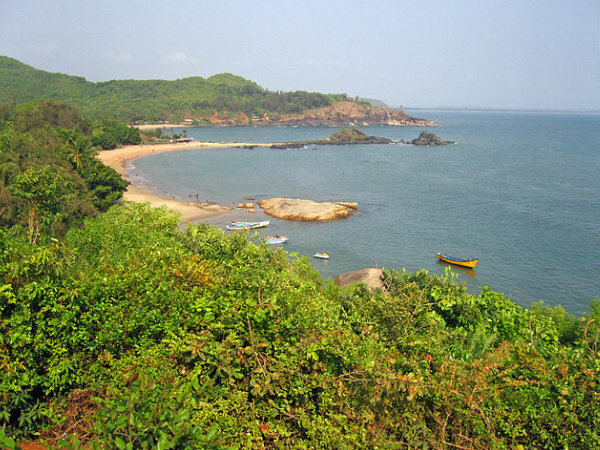 Gokarna Beach is a popular beach that is located in proximity to Gokarna Town. On reaching this beach, tourists can enjoy the view of Arabian Sea on one side and Western Ghats on the other. Water sports, sunbathing and enjoying the local cuisine are the things to look forward to here. The best thing about visiting this beach is its locale, which is devoid of any commercialisation, pollution and noise. The scenic beauty of the beach, the hammocks, drums and guitars present here create the ideal ambiance for tourists who are looking for tranquil atmosphere. Travellers planning trip to the Gokarna Beach can come here any time of the year. Om Beach is the most popular beach in this region, where tourists can enjoy an emotionally, spiritually and physically engrossing experience. This beach was named after the Hindu symbol 'Om' as its shape is similar to that of the auspicious mark, thus making it the only beach to be named as such. Travellers visiting Om Beach can undertake activities, such as water skiing, surfing and banana boat cruising, to name a few. Tourists can enjoy these water sports under the supervision of qualified instructors. It is a perfect place to unwind and relax with your family and friends. Idagunji or Idangunji is renowned among tourists as an crucial place of worship for the Hindus. A temple known as Mhatobar Shree Vinayaka Devaru, devoted to Lord Ganapati, is the prime attraction here. This temple has a two-handed idol of Lord Ganapati with Lotus and Modaka in each hand. Devotees and tourists visiting this temple are offered free lunch. It is believed that the wishes of worshippers who come here regularly come true. According to popular folklore, Lord Ganapati used to reside here, when it was known as Kunjaranya. This site also served as the place for performing penance by ancient rishis or saints. Travellers coming here can visit this temple and admire the various inscriptions on its walls. The Mahabaleshwar Temple is one of the most popular attractions of Uttara Kannada District. It is famous among devotees due to a Shiva Linga present here, otherwise known as Pranalinga or Atmalinga. This religious site is deemed to be as holy as the Shiva Temples of Kashi or Varanasi and is counted among the seven sacred Muktikshetras. The temple structure represents the Dravidian architectural style and has been constructed using white granite stones. Upon reaching the temple, tourists will notice that the Shiva Linga is placed in a square Saligrama Peetha with a hole in the middle. This central hole enables devotees to easily view the top of the Shiva Linga. Apart from this Shiva Linga, the temple also has a 1,500 year old carved stone figure of Lord Shiva. It is said that devotees, who catch a glimpse of the linga, are showered with blessings. Mahabaleshwar Temple is thronged by hundreds of devotees during the occasion of Shivarathri. Kudle Beach is located at a distance of 2 km from Gokarna town and travellers coming here will be swept away by the sight of a white sandy beach that is bordered by palm trees. Cafes and small huts that serve local delicacies are also present here. It is a perfect place to head to for lazing in the sun. You can also indulge in some water sports such as boating, surfing and water skiing. Half Moon Beach is a lesser known beach that visitors may choose to visit on their trip to Gokarna. This beach can be reached from Om Beach by foot or by boat. Half Moon Beach offers travellers a beautiful view of the Arabian Sea. Classical Indian huts alongside the Half Moon Beach add to the beauty of this place. Water sports activities are not available here but tourists can enjoy paintball, volleyball, canoeing, paddling and camping, along with swimming. In addition, you can enjoy sunbathing during the afternoons and spend nights lying in hammocks. By Air: Dabolim Airport, Goa is the nearest airport to Gokarna, situated at a distance of about 154 km. The airport is well connected to major Indian cities as well as Europe, Asia, America and Middle East countries. By Train: Ankola Railway Station is the nearest railway station to Gokarna, located at a distance of about 20 km. This railway station is well connected to major Indian cities and nearby areas. By Road: Gokarna is well-connected to major cities like Madgaoan, Dabolim, Bangalore and Mangalore via Karnataka State Road Transport Corporation buses. Travellers can avail private and tourist bus services to reach Gokarna from Bangalore that operates on a day-to-day basis.